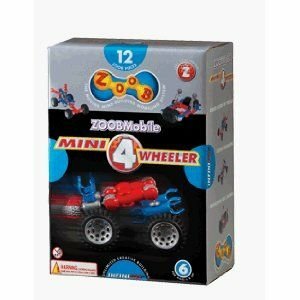 The Mini 4-Wheeler is a great ZOOBMobile starter set, or an ideal add-on to ZOOB® collections that need wheels. This set includes 12 ZOOB pieces in special colors designed for building cars, wheels that can work like gears, and an instruction guide for vehicles such as a Dune Buggy, a 3-Wheeler, and a Mini Pace Car. Because ZOOB pieces snap together so many different ways, kids can use their imaginations to create their own vehicles, and add on pieces from their ZOOB collections to make even more. The Mini 4-Wheeler is fully compatible with all other Infinitoy ZOOB pieces.